Snook, Redfish, Tarpon. 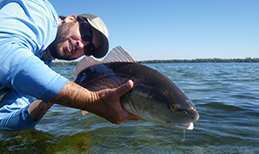 Flyfishing and light tackle, from beginner to expert, everyone will enjoy a day on Charlotte Harbor and Pine Island Sound in a flats boat. How much would you enjoy a beautiful day on the water with a knowledgeable and friendly guide? You will have fun even on a day when the fishin’s tough. The boat can accommodate two experienced fly fishermen (If you’re a newbie more room and time for helpful hints might be better). If one or two of the fisherman are children, three can fit in the flats boat. If you think you would have more fun fly fishing by improving your casting skills, just say the word. Your day on the water can focus on casting or fishing or both! And don’t worry, we won’t take any pictures of dropped loops or short casts, just happy fishermen with their catches. 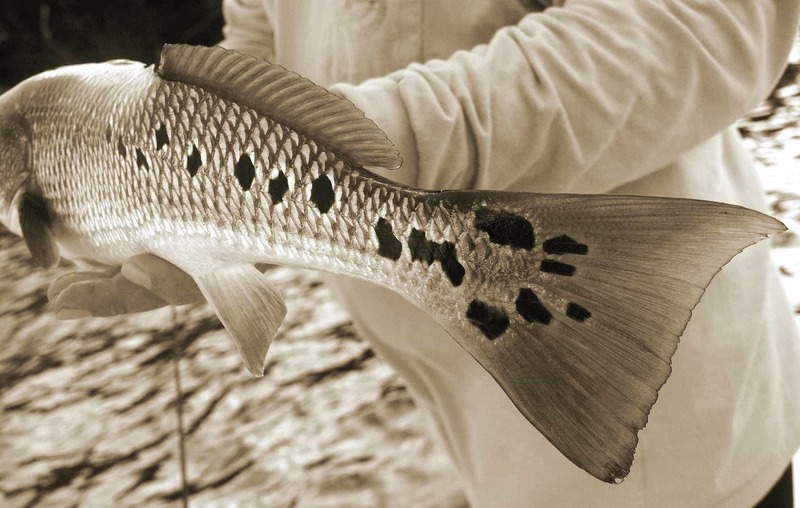 Boca Grande fly fishing is an adventure that every angler should be lucky enough to enjoy. Both fly fishing and light tackle enthusiasts will enjoy the multitude of angling choices. Boca Grande’s fishing covers a large area, it includes Charlotte Harbor (fed by both the Peace and Myakka rivers). Pine Island Sound, with its miles of shallow clean grass flats, Lemon Bay, with all its great tidal creeks and of course there is all the great beach fishing. With all the undeveloped mangrove shorelines and islands, we have roughly 200 miles of pristine fishing opportunities right in our back yard. Sight fishing with fly rods or light tackle is my specialty. 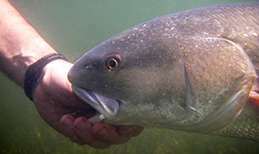 It is a perfect, all though sometimes challenging game, that keeps anglers coming back year after year. We launch the at one of several local ramps depending on the time of year, the current conditions and where the angler happens to be staying, which ever may be the closest to the best fishing destination. This means more time fishing and less time running. Most of the time, we do launch from Boca Grande Island on 12th Street at The Innlet which happens to be a great place to stay, allowing anglers to walk straight from their room right onto the flats boat. 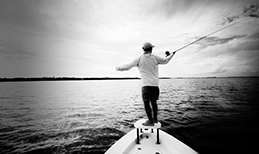 Fly fishing Boca Grande offers many options. 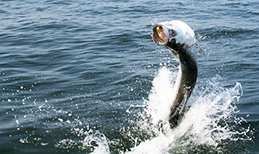 Tarpon, snook, redfish and sea trout are the most common species we target but we have many other opportunities that come into play through out the year. Cobia, False Albacore,Triple tail, Jacks, Snapper, Spanish Mackerel, Sharks and Flounder are just a few of the species that commonly bend our rods. When fly fishing Boca Grande we use my custom Grand Slam 17 flats boat though wading opportunities pop up during different times of the year. Day’s not spent guiding are often spent finding new hot spots. I use satellite photo software to locate new honey holes. These hidden gems have often experienced little pressure. Allowing fly fishing and light tackle anglers to reap the rewards of unpressured fish. Bring your favorite rods and reels if you like or feel free to use mine. I have a complete selection of Scott fly rods and Nautilus fly reels. Both are made right here in the good old U.S. Spin fishermen have the option of both St.Croix rods or the newest salt water rods by Lamiglass. As a full time guide, I feel my job is not only to put you on fish but to make sure you have a fun while you’re fishing. Hopefully helping you to better understand Boca Grande’s fish and how to catch them. In turn making you a better angler. Thanks for letting me share my passion for fishing with all of you!!! © 2015 Captain Jamie Allen. All Rights Reserved.